Some years ago, when I visited Klee museum in Bern (Zentrum Paul Klee), I was very impressed that the famous Swiss artist, in his difficult financial periods, when he had no money to buy canvases, he used a lot of newspapers/newsprints as a media in order to continue his art adventure, in any conditions. Some weeks ago, when my friend Tepora Watene, the Maori artist who became a big fan of Archetypal Expresionism, recommended me Tracey Tawhiao’s art, a well-known international Maori artist and poet from New Zealand, I had the surprise to discover the same preoccupation and pleasure to use newsprints as a media. Tracey had the idea to paint on newsprints because she is also a writer and a huge swallower of texts. And I think Tracey’s art vision is very close to my new awarded art concept/movement, the archetypal expressionism, because she is a follower of Paul Klee and she explores the old and atemporal Maori archetypes for her impressive and expressive art compositions, most of them almost musical, where the accompanied contrasts of the vivid colours, the proliferation of curve white lines, like in the strange primordial Cucuteni culture from Romania, the mixture of actual texts and universal symbols create an unique atmosphere of atemporal aesthetic space. In my opinion there are six major paradigms in the painting of the XXth century and they have been invented by Paul Klee, Pablo Picasso, Wassily Kandinsky, Piet Mondrian, Salvador Dali and Francis Bacon. When you study the developments of the global art market in the first two decades of the XXIst century, you may notice that the followers of the cutting edge figurative British painter Francis Bacon, like in our days the British artist Jenny Saville or the Romanian artist Adrian Ghenie, are are the most successful. I think there are already some signs (the enthusiasm among some major international artists, curators and native artists from America, Africa and New Zealand for the archetypal expressionism movement, the group show Forever Now, curated at MoMA, New York by Laura Hoptman, etc) that after 2020 the global art market will be dominated by Klee’s followers. And as I always asserted, Klee was a forerunner of archetypal expressionism in painting, in the XXth century, together with Ion Tuculescu and Norval Morrisseau. 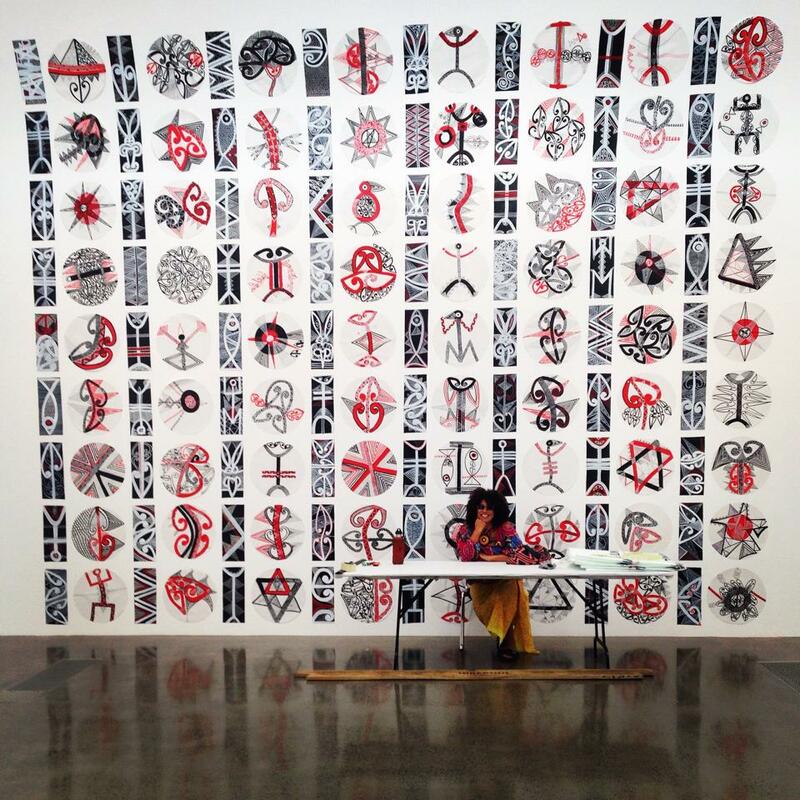 Tracey Tawhiao (Ngai te Rangi, Whakatohea, Tuwharetoa) was born in 1967. She is a multi-skilled contemporary artist who has studied and worked in a variety of fields. She is a writer, performance poet, filmmaker, qualified lawyer and practising artist. 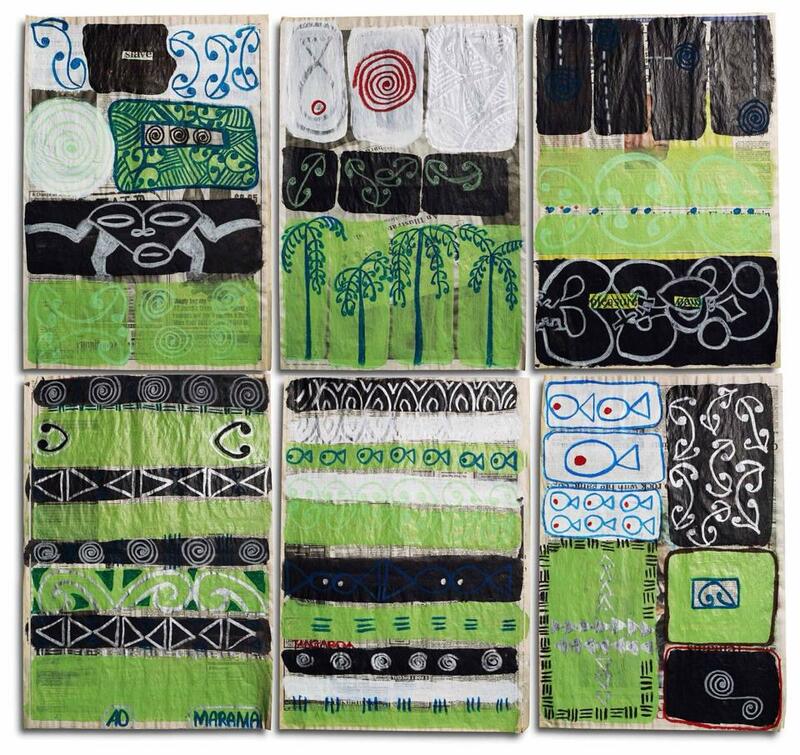 Her artworks convey the breadth of her experience and her position as a Maori woman in a European-dominated society. She is a regular contributor to Te Ao Maori Collective and her work has been incorporated into several Contemporary Maori art group shows. The book ‘Taiawhio: Conversations with Contemporary Artists’ includes a chapter on this artist and one of her artworks features on the cover of this publication. 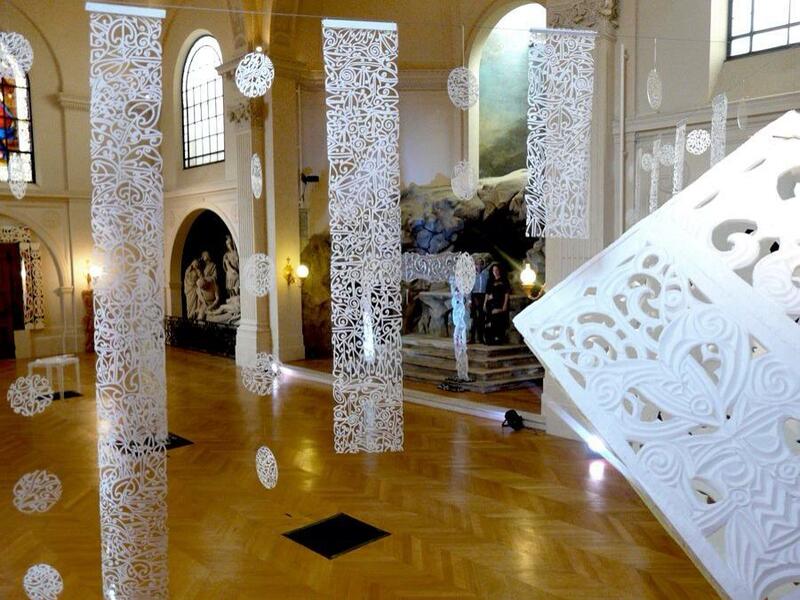 Her practice employs the unconventional art material of newspaper. 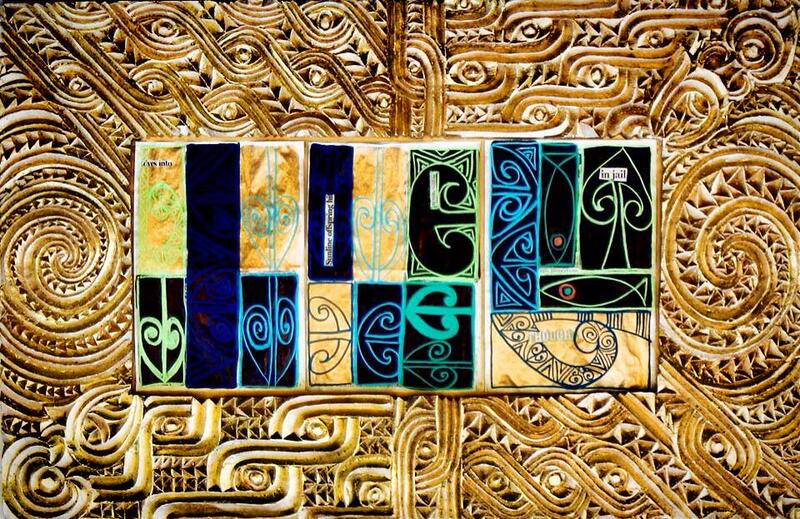 Her use of this media evolved from her interest in the written word and text and is an extension of her live performances in which she highlights the oral aspect of Maori history. 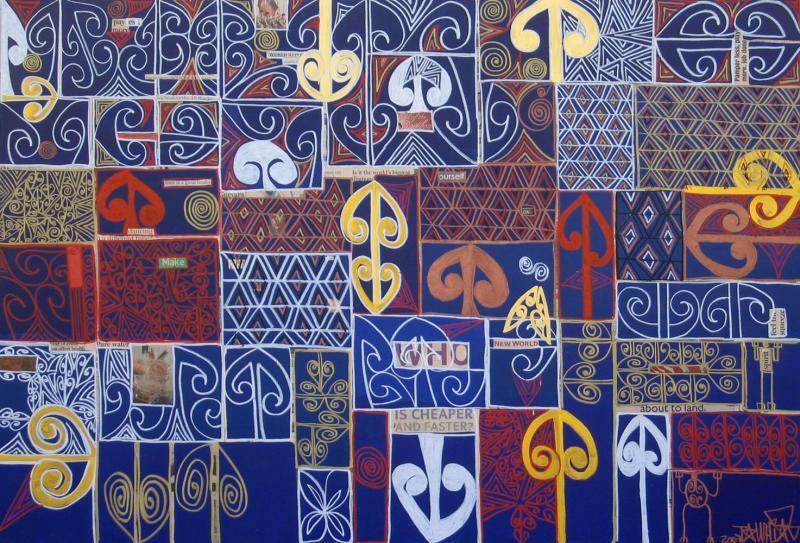 The newspaper series has its origins in Tawhiao’s youth, when as a way of brightening up her grandparent’s home on Matakana Island in the Hauraki Gulf, she suggested redecorating their newspaper-covered walls with colourful murals. While completing this project she noticed the negative connotations in the headlines and decided to embark on her series of artworks that subvert the ‘truth’ of the daily news. 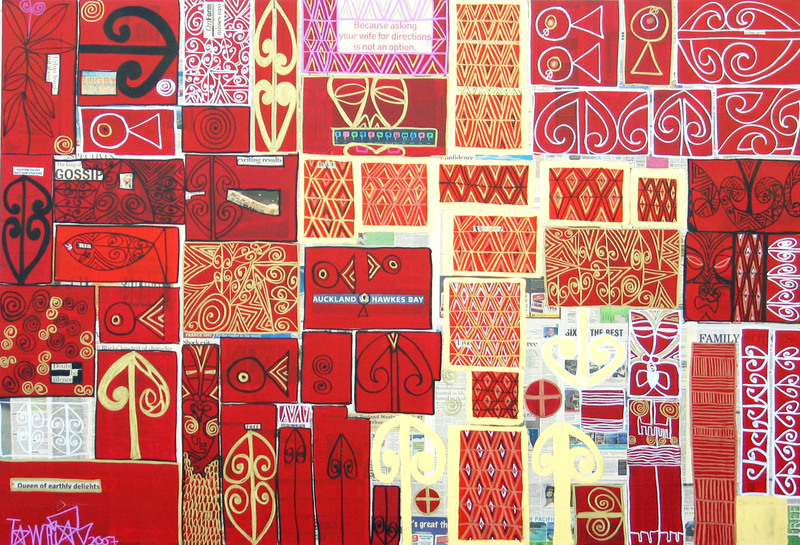 Tawhiao employs pages of newspapers such as the New Zealand Herald and the New York Times and obscuring certain passages of their text using alternating blocks of boldly coloured oil pastel and single graphic symbols. 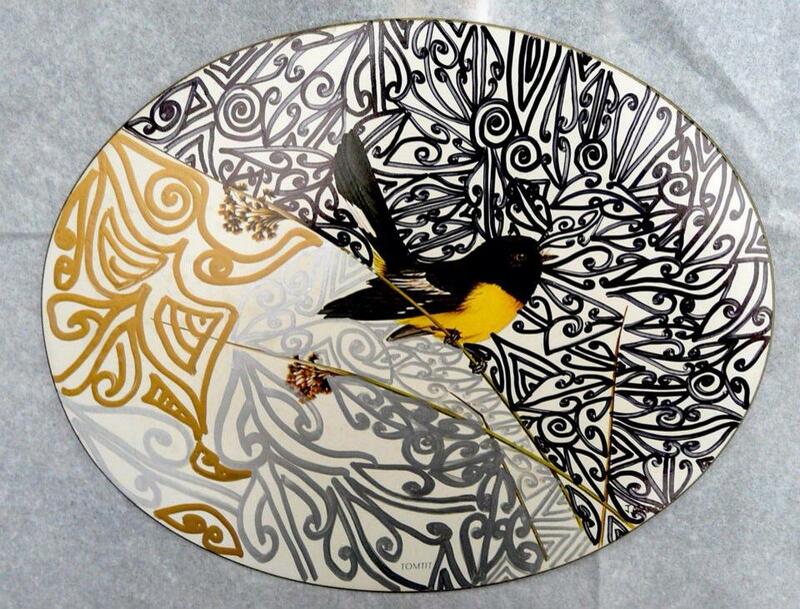 The symbols she uses are sourced from Maori rock art and Creation myths. 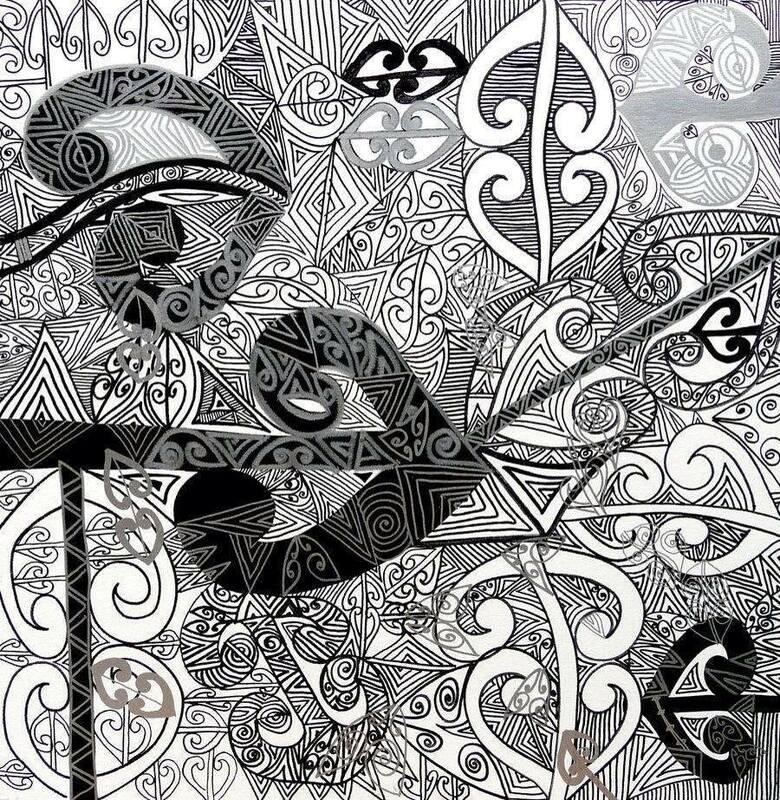 She has also created her own visual language comprising of fish motifs and other symbols that relate to her Matakana Island heritage. Her blanking out of news stories acts to ‘rewrite’ them from an alternative, Maori perspective. By obscuring certain words in a headline or passages of an article she changes the focus of each news item and subverts the editorial slant. This entry was posted in archetypal expressionism, Art and tagged adrian ghenie, archetypal expressionism, Francis Bacon, ion tuculescu, Jenny Saville, maori art, Matakana Island, Norval Morrisseau, Paul Klee, tepora watene, Tracey Tawhiao. Bookmark the permalink. 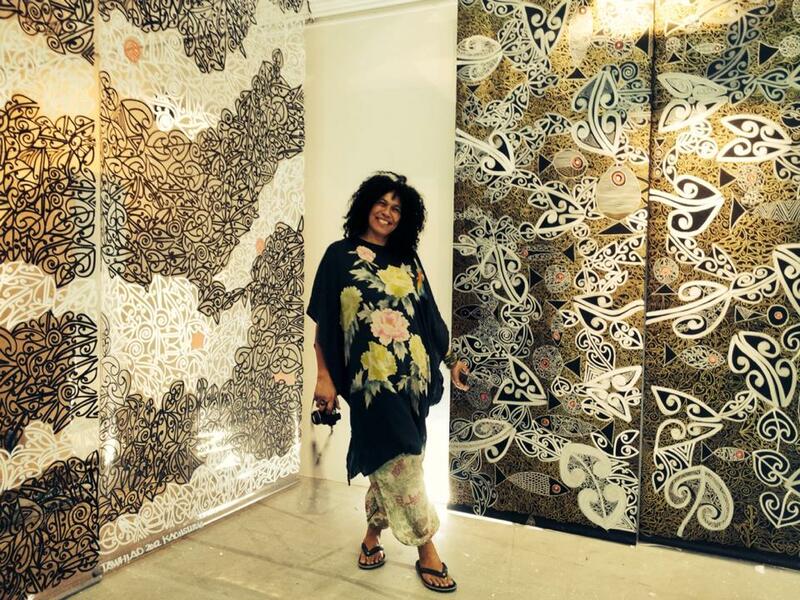 Tena tatou Katoa Constantin Severin and Tracey Tawhiao; Dear Constantin thank you for writing this article about fellow Maori Artist and neighbouring iwi/tribe member, Tracey Tawhiao. My personal opinion is this; ‘Tracey epitomizes the revolution of awareness taking place in Maoridom today. She is already in my eyes the greatest contemporary Maori Indigenous Artist of New Zealand of his 21st Century and represents the cultural and spiritual awareness awakening our people.’ Kapai toi mahi e hoa Tracey Tawhiao, kia ora, Tena tatou Katoa, Tepora Watene, Tohunga Mahi Toi at; Toi Toi Studios & Productions NZ. Bula Severin. I’m a visual artist working in paint and printmaking. Thank you for this wonderful article on Tracy. [Incidentally, I found you on Pinterest via another poster’s pin]. I’ve been looking at Tracy’s work for inspiration for my own work. Her preoccupation with Maori land rights, NZ government laws regarding those rights and the role of the printed matter in what you describe above resonates with me on so many levels as I return to Fiji to start my own discussion regarding what’s happening with the land & sea issue in this country. Tracy inspires me. Vinaka vakalevu. Hi Susie! I’m very glad that my article was helpful and inspiring for you. Greetings from Romania.